I feel I am being rewarded for all of those slightly stressful, messy and sometimes time sucking cooking sessions I did with the girls when they were very little because today they were super helpful and really independent to the point where they were doubling up our food preparation time. Next, Little M made cream cheese icing and then passed it to Big Sis for the courgette cake which she jammed and iced all on her own. Lastly, Little M made water icing for her completely unaided icing and decorating session. I just kept providing the next bowl of things with a simple instruction - mix, stir, spread, cut, tickly fingers or even 'just have a go yourself' and off they went. There was a sort of British Bake Off running commentary as we worked, where I had to pretend I was Mary Berry but heyho it got the job done. Lunch anyone? Courgette and pesto soup, cheese scones followed by plum and apple crumble. Oy don't be greedy, the cakes are for tomorrow. We just scoffed the raspberries! Thanks for stopping by. Are you tuning into the Bake Off? My girls are rooting for Martha. Here is one for the boys. We have been invited to a wedding with a dress code called 'a touch of country tweed'. Bloke has been asked to read a poem for his very good friend and also has to wear a tweed style waistcoat of his choosing. This is where I stepped in. 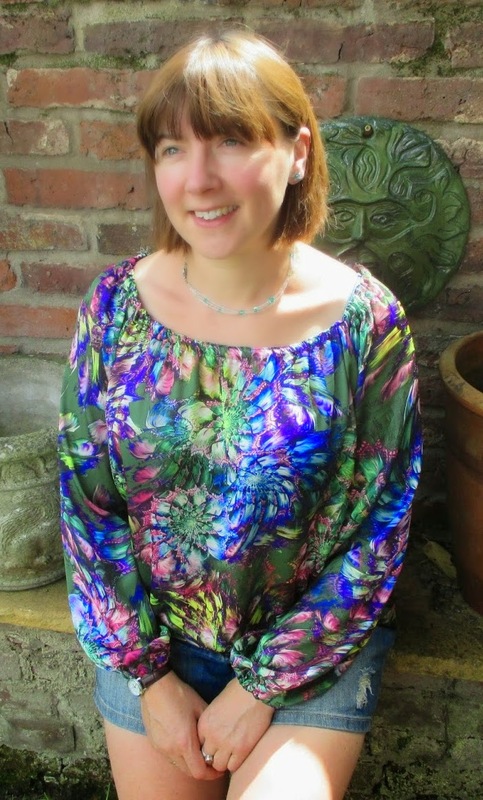 I have recently joined the blogging team at White Tree Fabrics so I ordered a pattern and some sumptuous satin lining. The main fabric I already had, it is some welsh wool from years and years ago, the 1980's I think, which someone gave me. Ta dah! The colours in the wool are perfect for matching any colour trousers or shirt - grey, navy, brown, white. The quality of the lining from White Tree really made the back though. I looks so luxurious. The pattern construction was not for the beginner. It did have little pockets on the front with welts but the fabric was too thick to get the welts to sit flat (and I was a bit rubbish at it if the truth be told!!) so I binned that side and cut out another one. He was happy with a smooth fitting flat front. "What would I have put in a tiny pocket like that anyway?" he quizzed. I popped in a little label from me to him. This is the pattern from White Tree Fabrics. You can be a real master and try the one with the collar - it has 13 pieces in it, or just make a plain one like I did. So I know you will be wondering what does it actually look like. We went to the wedding in our homemade outfits and lapped up the compliments. Thanks for looking at my project, I love it when you visit. Thanks to all at White Tree Fabrics. Hello everyone and my new followers. This month in my Minerva Crafts post I have made a peasant style blouse that feels nothing like 'peasant'... The fabric is stunning. This pattern is a vintage find from 1978. The t-shirt and skirt are a definite no from me but I handed over my £1 because I loved the top. It reminded me of the children's ones I had done from this pattern here. The pattern was easy. Two sleeves, a front and a back. I used my overlocker to finish and sew the seams and then made casings on my normal machine for the neck and the sleeves. I like to top stitch my elastic casings. It helps them lie flat and stops them looking like a pump bag on a garment! Sew the seam that makes the casing then press flat. Next sew 2/3mm from the edge of the fabric to make a neat edge instead of a baggy one. The other technique that was useful with this fabric was using a blind hemming foot. If you have one, dig out your manual and have a go, it makes a beautiful neat hem only showing little stitch pick ups along the way. The reverse looks neat too. If you like this fabric you can get it from Minerva crafts here and it comes in other colour ways too. More shades of grey to share with you today. I have been helping out looking after a few of my friends children a couple of times this holiday and it has thrown up a surprising amount of sewing time - the girls are all busy entertaining each other and I am surplus to requirements except when snacks and drinks are called for. I started to make a top called 'drapes and flounces' however, I didn't think the sleeves were that practical so I made them straight without the flounces. I loved the finish on the back of the neck with some under stitching on the facing. I loved the soft finish of the set in sleeves. But wait, I did not like the drape collar part. Something has gone wrong here. I took the children to a new play barn to try and remedy the situation. Unpicking while I was out drinking cappuccino seemed a whole lot better than trying at home. I returned and tried again with new collar pieces that were a bit bigger to give the drape implied in the title, but to no avail. I cut my third lot of collars and made this instead. Which, when my own ample bosoms are present, sits really well. My dress form, Clara, is a bit flat chested so it looks a little slack here. My new boots arrived yesterday, more on the skirt another time but I would say that is an outfit. Wouldn't you? If I wore mustard tights would I look like a chicken? and Do you think I need to topstitch around the collar? All advice welcome. So in summary, no drapes and no flounces! Today, I start with our weekend harvest as my first picture not the last one like I normally do. A lady at the allotment encouraged me to pick from her basil 'forest' growing in her greenhouse. She offered, we obliged. It made the most vibrant pesto and that spurred us to invite some friends to share it with. We went to the cabin for a walk, play and shared dinner. I did try to make my own Mozzarella from a kit that my brother bought me at Christmas but it went a bit wrong and turned into creamy cottage cheese instead. I added chives and we ate it on crackers all the same. 'notzzarella' was the funny joke of the afternoon along with a lot of other 'cheesy' child friendly puns. We simply had a wonderful meal with great friends. We slept over after our friends went home with their little ones. The Secret Seven is ideal reading material to accompany our own little adventures; we will be having a cabin password next! Big Sis watched two buzzards for ages in the fading light under the man blanket whilst playing with her first wobbly tooth with her tongue. I crocheted four more squares for the 'cabin only' blanket. When the children had gone to bed, bloke and I sat by the fire and were treated to some distant fireworks which were amazing. We all admired the view which is ever constant in one way and always changing in another: harvested fields, a worn out green in the trees and hedges along with sheep nibbled grass today. This post turns full circle as I finish with another harvest, apples. It has been so windy and some good ones are falling down already, perfect with a few (and I mean a few) blackberries but many more of those to come I can see. Why oh why have I never owned a crocheted phone case? It beggars belief! Anyway a good friend of mine and her daughter came to learn to crochet, have lunch and chat today so I wanted an easy project for them to kick off with and I thought: I haven't even got one to show them. I used thick DK (art of knitting yarn) a 3mm hook and made a foundation chain of 25 stitches. I joined it into a circle with a slip stitch, without a twist, then tested it round my phone. I used a stitch marker to mark the end of the round and made two rows of dc in white. I continued in blue until it was the length of my phone and then rather lazily just dc along the bottom without turning it inside out or breaking the yarn. Sew in your ends and add the cutest button you can find in your stash. I didn't sew it on, I tied it on by threading ribbon through my needle and tying it at the front, twice. Big Sis sat alongside us 'ladies' learning to chain. It is amazing what you can make for your Barbie with just chain stitch. ...a belt, scarf and hair tie. A happy time for all of us. PS.I am experimenting with larger pictures. Do you feel shouted at? Do let me know.